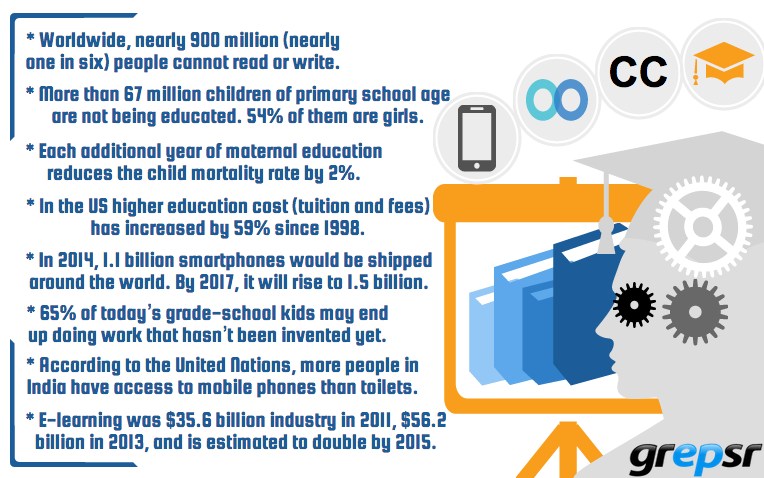 How are Data Sharing Tech Revolutionizing Education? Education-related statistics show the stark contradictions of our time, but they also tell us about the immense possibilities and big changes that are just around the corner. The rapid development and spread of disruptive technologies is breaking the conventional boundaries and pushing us into the new era of data-driven insights and efficiency. Data-enabled split-hair precision of information and augmented intelligence are redefining our approach to problem solving. Our increasing access to real-time data is enabling us to find the real-time solutions, improving our ability to predict and tackle problems before they come to the surface. The use of learning analytics in education is one of those examples. Universal access to education, achievement of the educational goals, and its objective assessment have always remained some fiercely debated topics in education around the world. For ages, people have raised questions about the effectiveness of the modern education system, and many of its vocal critics have called for dismantling the notion and structure of modern education altogether. Sir Ken Robinson is a recent example. The facts that everywhere the cost of college and university education has been going above the roof, and a large number of students are left to struggle with debt and unemployment have also underlined the crisis of modern education. The fact that online education, a mere possibility only a few years ago, has already gone mainstream proves that today’s education-based startups, with their innovative Massive Open Online Course (MOOC) and disruptive educational technologies, are on the course of redefining education. The fact that EdTech companies like Coursera, Khan Academy, EdX, ALISON, Udacity etc. have been providing online courses and learning opportunities to millions of students and learners around the world indicates that massive changes in education are underway. Moreover, take the progress in the area of making ultra-cheap tablets accessible to the kids around the world (India’s government-subsidized $21 Akash2 tablet is an example). When students have such latest technologies in their hands and and access to a vast resource of knowledge at their fingertips, they find themselves in the digital era of education that offers them greater freedom and multiple ways of engagement. Students learn better when they love what they do. 1.2 million students drop out of high school annually (7 thousand students per day) in the US for various reasons. While this number is staggering, you will find that America is doing fairly well when you bring the global picture (most particularly, Sub-Saharan Africa and and South-East Asia) into the context. Imagine you could do something about improving the state of education across the globe. Imagine you had a way to accurately predict who among the students are most likely to drop out and prevent it before it actually happens. Imagine you could tell what intervention techniques work best in the specific case. Educational data mining and learning analytics are precisely the tools you would need for doing these jobs. Apart from being a major area of public investment, education is also the 4th largest—7 trillion dollars—industry in the world. Data mining and learning analytics are highly instrumental for both the public and private sectors of education in collecting and analyzing student data, in discovering hidden patterns in the data, and in developing a better understanding about what contributes to the effective learning and retention. As more and more educational technologies are being integrated into the classrooms, as more and more students spend their time online, and as education is becoming more and more hybrid with the increasing use of interactive digital curriculum, a vast amount of data is being generated as a result. Educational data is vital for learning analytics which, in tern, provides deeper insights into what is and what can be done to improve education. Virtualization — Going paperless by using digital technologies and cloud hosted services, replicating the physical realities in the digital media and breaking the time and space boundary so that learning can take place in the virtual classes. Personalization — Developing individual student profiles and designing coursework and contents for the customized and self-paced learning. Collaboration — Grouping students on the basis of their interests, aptitude, or performance and engaging them in peer-to-peer problem-solving activities using collaborative network technologies. Gamification — Designing engaging and interactive coursework for the better cognitive retention and for getting students motivated to move to the higher levels of achievement. Visualization — Using the student data for getting a clear insight into the effectiveness of the coursework, instruction, student activities and progress etc. Prediction — Simulating, sampling, and modeling the coursework and instruction methods and techniques for getting information about the most likely outcome in the future. Intervention — Using behavioral and academic data and prediction models for detecting the earlier patterns of disengagement and under-performance to prevent the risks of undesirable student behaviors. Evaluation — Using the holistic data for making an accurate assessment of the overall achievement of the targeted goals and tailoring the future plans to address the specific needs. Recommendation — Providing the both real-time and end-of-the-session feedback and recommend the changes for improving both the individual and group performance.